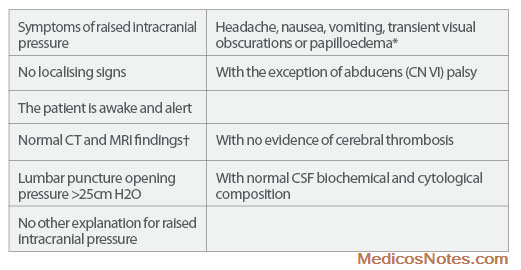 All of them occurring in the absence of enlarged ventricles or the presence of intracranial mass on CT or MRI. As it is a syndrome and not a disease pseudotumor cerebri has a number of causes or pathogenic associations. The most common form of pseudotumor cerebri is benign or idiopathic intracranial hypertension. Symptoms and signs that are restricted to those of elevated intracranial pressure. Increased cerebrospinal fluid (CSF)pressure with a normal composition. When the CSF content is abnormal the diagnosis of idiopathic pseudotumor cerebri should not be accepted. Intra cranial hypertension literally means that the pressure of the CSF which surrounds the brain is too high.Raised intracranial pressure is transmitted along the paths of the optic nerves, thus causing the nerves to swell resulting in papilledema, which can lead to loss of vision and blindness.